Gutters are a vital component in just about every roofing system, as they are responsible for removing water from the roof in an organized manner. 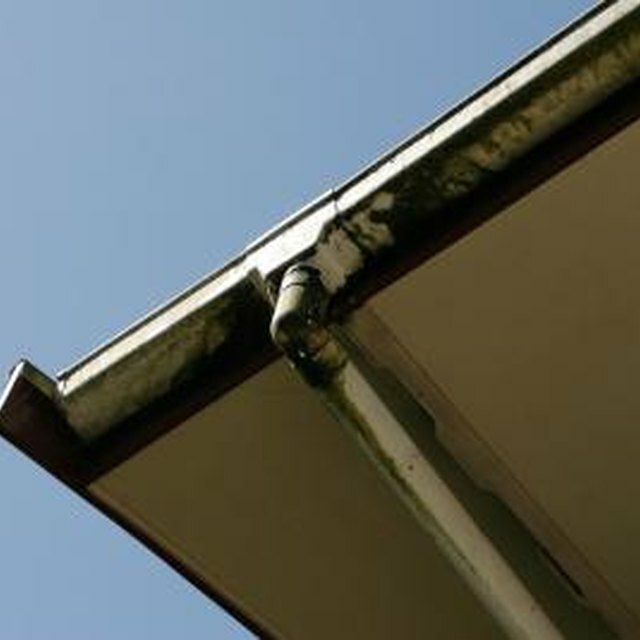 Gutters have been made in several different ways over time, and modern advances in construction technology offer a system of gutter installation where the gutter is pulled from a long strand of material, instead of several pieces fastened together. The seamless gutter system is a commonly used gutter type, as its installation can be faster, and in some cases, cheaper. Estimating the amount and cost of seamless gutters is the first step in its installation and is a generally straightforward task. Measure the length of roof edge that the seamless gutter system is proposed to span, in lineal feet, using the tape measure. Round this measurement to the next higher whole foot, to make later calculations easier. Repeat this on any other roof edges where a seamless gutter is to be applied, and add together to find the total length. Make a tally list of all necessary gutter downspouts; gutter downspouts are often required and designated for specific areas of the gutter span and will most commonly be located at either end of the span. Measure the height of the roof edge, using the tape measure. This measurement is required for downspout material estimation. Multiply this measurement by the number of tallied downspouts to calculate the total length of downspout material. Multiply the total length of seamless gutter material by 105; this will add an extra 5 percent to the total length that will account for any wasted material during construction. Call a local gutter or roofing supply store to get a quote of the current cost of seamless gutter material per lineal foot and the cost per downspout. Multiply the cost per lineal foot and per downspout by the total length of gutter material and total number of downspouts. Add these costs together to calculate the total cost of material.